Trevor Fitzgerald, the author of Crispp theme presented Developing a WordPress Theme (links to his slides) at today’s a January WordPress Meetup. Crispp is a very clean theme with customizable options. It’s simple and flexible. He decided to choose WordPress.org theme directory as a channel of distribution because it’s easy, you can get good exposure (from the directory’s “Recently Updated” list & sites like Weblog Tools Collection which features new themes), and nice download stats is provided. Other benefits for making your theme available for download are traffic to your site, Google Page Rank (“Designed by” footer link), and increase in inquiries for additional development services. His theme has been downloaded 1500+ times in one month. He says it’s good to make your theme extensible and flexible. 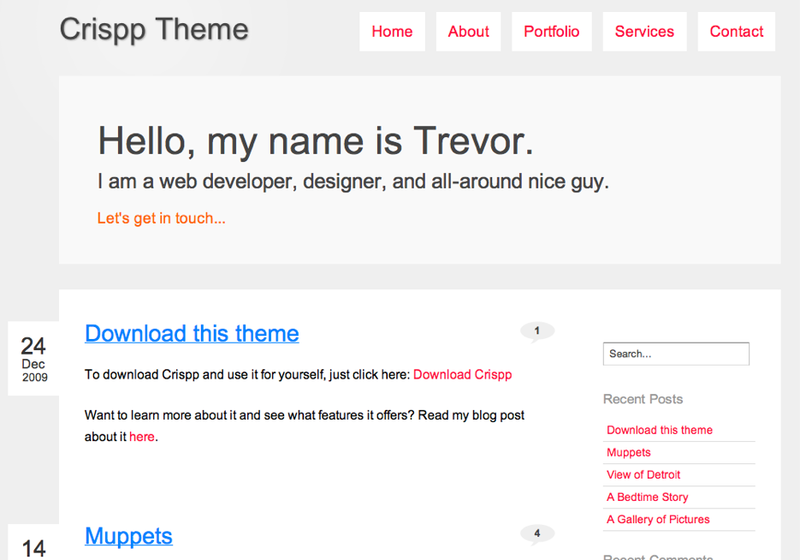 Crispp is widgetized, has a theme options panel where you can edit the Welcome message on the home page and colors. He is developing another theme called “Earthly” – contact him if you want to a sneak peek! We are always looking for presenters at the meetups. Please contact us if you are interested.